Love The Australian Women’s Weekly? Of course you do! To celebrate all the fantastic cooking advice the magazine has given over the years, this new book collects together its 1000 best recipes. 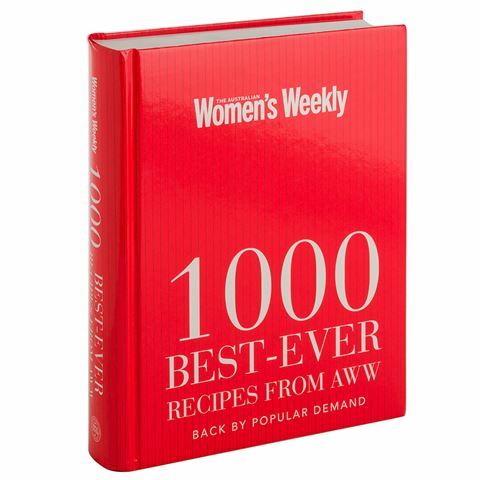 The 1000 Best-Ever Recipes From AWW is the best way to add bring some fresh ideas into your kitchen. For over eighty years, The Australian Women’s Weekly has helped bring exciting and delicious recipes into thousands of households all over Australia, as shown by this incredible new collection. Filled with over 600 pages worth of meal ideas – featuring everything from meat pies to plum and hazelnut upside-down cake – there’s no chance of you running out of meal ideas anytime soon. Accompanying the recipes are also a number of photographs, just to whet your appetite a little more. So if you’re ready to push your cooking skills to new heights, then be sure to have a look at 1000 Best-Ever Recipes From AWW. From healthy meals to quick ones and Asian recipes to European ones, this is as comprehensive as cookbooks get. Affordable meal ideas for just about every occasion. Fourteen different chapters covering a range of different areas. Index allows for easy navigation. Published by The Australian Women’s Weekly.